Fannin County, Texas - 1841, H.M. Pettigrew, 31 died from rattlesnake bite received while clearing land. - Nancy Wright, 4, July 10th 1845, died of rattlesnake bite. Parker County, Texas - 10/24/1854, Maggie Lee died from rattlesnake bite. First child to die in Parker County, Texas. Augusta County, Virginia - 1859, William A. Perrin killed by rattlesnake bite at Stribling Springs. Saline County, Kansas - Frederick Louis Niemann, died in 1873 from rattlesnake bite. 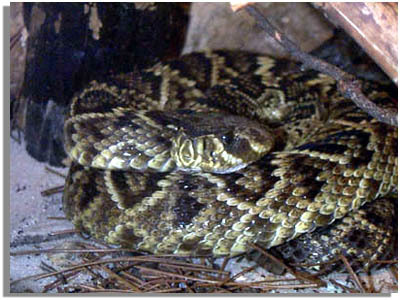 Texas - July 1882, James Ananias Brannon, 2, died from rattlesnake bite received while lying on a blanket. Kansas? - Rebecca O. Andrews, (about)28, Died from rattlesnake bite around 1890. Virginia - July 9 1907, Mary Bull, 12, died from rattlesnake bite, Buried in Shenandoah County. Wisconsin - only one known rattlesnake bite fatality in Wisconsin since 1900. North Dakota? - 6/1913, two Wilson children bitten and died while family sleeping on prairie. Billings County, North Dakota - 1915, Helen Moomey, 4, died from rattlesnake bite received while playing with friends near her house. Pickens County, South Carolina - July 1928, Rebecca Nimmons, 19 was Killed by rattlesnake bite. Lafayette County, Florida - Jerry Frier, 7, died June 22nd 1943 of rattlesnake bite. Ontario - Only two known fatalities due to rattlesnake bites. Lakewood, Florida - September 2000, 2 year old Derrick Lema was bitten in the thigh by a Diamondback rattlesnake while helping his dad in their back yard. Riverside County, California - May 2003, man killed by rattlesnake bite. Putnam County, Florida - October 2005 Joe Guidry, 54, County fire marshall, went to help a neighbor who had spotted a rattlesnake while mowing the grass. Guidry shot at the snake and it went under a shed. when he reached for it he was bitten and venom went directly into a vein.